To cute to spook any little ghost. 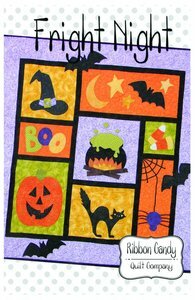 This fusible web applique wall quilt is perfect for everyone who loves Halloween! The finished quilt measures 40” x 42”. The pattern comes with detailed instructions and full size templates. Make the whole quilt or use the images and create a table runner, Trick-or-Treat bag or decorative pillow. Happy Haunting!